On this page you can download training resources for SAGE Research Methods: a database containing thousands of resources, unique content and research tools, dedicated to research methods across a range of subject areas. The materials are organised into two categories. 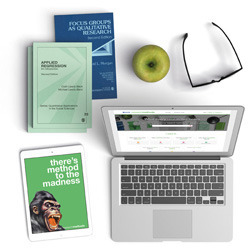 The first category contains resources that anyone can use to learn about SAGE Research Methods independently, such as self-guided PowerPoints and product tips. The second category contains resources that librarians can use to deliver training and information sessions to other users, such as presentations and lesson plans. This resource will teach you everything you need to know about SAGE Research Methods. You can dip in and out to learn about something specific, or follow the whole presentation in order, depending on your needs. If you're a faculty member, researcher or student, check out this resource to learn the most essential things about SAGE Research Methods, as chosen by our knowledgeable Training team! If you're in charge of promoting or training on SAGE Research Methods at your instituition, see what our Trainers think you should know - all our top tips on a single page! This user guide outlines the core functions of SAGE Research Methods, including searching and browsing for content, setting up a personal profile and adding items to Reading Lists. This 2-minute video demonstrates the core functionality of the SAGE Research Methods platform, including running searches, refining your results according to your needs, and using one of our most popular research tools - the Methods Map. This presentation covers all the key information about SAGE Research Methods in a concise and logical format. You can use this as a standard presentation, or use it alongside the training activity to deliver a more in-depth, interactive training session to your patrons. This resource is designed to be used alongside the Training presentation delivery guide. This resource provides tips and advice from the SAGE Training team about how to deliver your own training session on SAGE Research Methods at your institution. The delivery guide is designed to be used alongside the Training presentation. This worksheet forms the basis of an activity to be used in a training session to build knowledge on SAGE Research Methods. The Training activity is designed to be used alongside the Training activity delivery guide. This resource provides tips and advice from the SAGE Training team about how to deliver your own training activity on SAGE Research Methods at your institution. The delivery guide is designed to be used alongside the Training activity.